Below are some of the best fasting quotes from both modern medical and health professionals as well as famous historical figures. History shows us that fasting was considered a natural therapy for so many of the ails of the past. Modern professionals are telling us the same is still true; that fasting will alleviate a host of ailments that plague us in our modern world. The fasting quotes are divided into four categories: Historical, Modern M.D.s, Other Health Professionals, and Religious Writers and Figures. "Fasting is the greatest remedy-- the physician within." "Instead of using medicine, better fast today." "The best of all medicines is resting and fasting." "Everyone has a doctor in him; we just have to help him in his work. The natural healing force within each one of us is the greatest force in getting well. ...to eat when you are sick, is to feed your sickness." "I fast for greater physical and mental efficiency." "A little starvation can really do more for the average sick man than can the best medicines and the best doctors." "Nature heals, the doctor helps!" "Every fool can fast, but only the wise man knows how to break a fast." "I believe that fasting is the "missing link" in the Western diet." 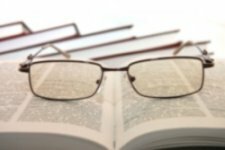 "From a medical point of view, I believe that fasing is not utilized often enough." ".... fasting is one of the best overall healing methods because it can be applied to so many conditions and people." "Fasting is the single greatest natural healing therapy. It is nature's ancient, universal 'remedy' for many problems. Animals instictively fast when ill."
"Due to [the] effects of fasting, a fast can help you heal with greater speed; cleanse your liver, kidneys, and colon; purify your blood; help you lose excess weight and water; flush out toxins; clear the eyes and tongue; and cleanse the breath." "Therapeutic [water] fasting accelerates the healing process and allows the body to recover from serious disease in a dramatically short period of time." "Fasting, combined with nutritional competence, removes the most significant causes of disease." "Therapeutic fasting is not a mystical or magical cure. It works because the body has within it the capacity to heal when the obstacles to healing are removed. Health is the normal state. Most chronic disease is the inevitable consequence of living a life-style that places disease-causing stressors on the human organism. Fasting gives the body an interlude without those stressors so that it can speedily repair or accomplish healing that could not otherwise occur in the feeding state." "The job of fasting is to supply the body with the ideal environment to accomplish its work of healing." "The body's wondrous ability to autolyze (or self-digest) and destroy needless tissue such as fat, tumors, blood vessel plaque, and other nonessential and diseased tissues, while conserving essential tissues, gives the fast the ability to restore physiologic youth to the system. By removing or lessening the burden of diseased tissue, including the fatty tissue narrowing the blood vessels, fasting increases the blood flow and subsequent oxygenation and nutrient delivery to vital organs throughout the body." "Man is the only 'animal' who persists in eating when he is sick, even though he may have no appetite and food makes him nauseous." "Fasting is a calming experience. It is restful. It relieves anxiety and tension. It is rarely depressing and it is often downright exhilarating." "Fasting is the strongest appeal to the human being's natural powers of healing and self-rejuvenation, on both a spiritual and corporeal level." "I often observe in the fasting participants that by four days of fasting, concentration seems to improve, creative thinking expands, depression lifts, insomnia stops, anxieties fade, the mind becomes more tranquil and a natural joy begins to appear. It is my hypothesis that when the physical toxins are cleared from the brain cells, mind-brain function automatically and significantly improves and spiritual capacities expands." "Although beginning my practice in fog-covered medical superstition, I came to the conclusion that only nature can practice medicine." "I contend that during illness feeding becomes a burden to the sick. It uses energy that otherwise would be used to fight the illness." "I must say in all seriousness that fasting when combined with a properly selected diet is the nearest approach to a 'cure-all' that is possible to conceive-- profoundly simple and simply profound!" 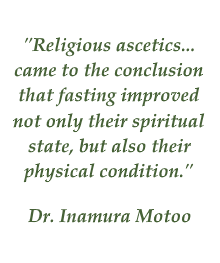 "Religious ascetics, who led their lives abstaining from food, came to the conclusion that fasting improved not only their spiritual state, but also their physical condition, and through fasting many diseases could be cured." "I assert that fasting is the most efficient means for correcting any disease." "Fasting creates a condition of low concentration of toxic wastes in the circulatory system. This is sensed by the plasma membrane of each cell and each cell will then let go of its load of toxic wastes." "The practice of fasting tacitly acknowledges the fact that ours is a self-healing organism. Healing occurs naturally if it is allowed; improper or excessive food simply thwarts the natural ongoing healing processes. Forcing a sick person to eat 'to keep up his strength' overlooks the fact that digestion uses up strength too: more often than not, the available strength is better used for healing the problem at hand than for digestion." "Fasting is like being a gifted sculptor who knows how to take areas of fatness and thinness and give them proper form." "I do not think it is possible to over-emphasize the fact that the physical sensations of fasting are, for the most part, far more pleasurable than the real or illusory delights of feasting." "We must restore fasting to the place it occupied in an ancient hierarchy of values 'above medicine'. We must rediscover it and restore it to honor because it is a necessity." "The skin becomes more youthful [during fasting]. The eyes clear up and become brighter. One looks younger. The visible rejuvenation in the skin is matched by manifest evidences of similar but invisible rejuvenescence throughout the body." "When we fast, energy is freed for a thorough housecleaning of the system. The body becomes lighter, more flexible; the mind becomes clearer and more creative. Greater intuitive powers may develop and deep spiritual insights may be experienced after a period of time. A feeling of well-being arises when the energy is freed in this way -- problems suddenly become solutions and ideas flow from nowhere." "Fasting is a natural method of healing. When animals or savages are sick, they fast." "The purpose of fasting is to loosen to some degree the ties which bind us to the world of material things and our surroundings as a whole, in order that we may concentrate all our spiritual powers upon the unseen and eternal things." "Fast because it is good for you...[it can be an] exercise to get the body in shape to be alive to itself. This process frees the self to be more sensitive to the Creation, to ourselves, and to our histories." "Prayer brings us halfway to God, fasting takes us to the gateway of heaven." "Fasting is the soul's nourishment, it reins in language and seals one's lips, it tames desire and calms the choleric temperament. It awakens consciousness, renders the body docile, dispels nightly dreams, cures headaches and strengthens the eyes." "Seek the angel of fresh air, the angel of water, the angel of sunlight, and the angel of the earth, and invite them to stay with you throughout the fast!" "When you fast, do not look dismal, like the hypocrits." "Be honest, be sincere. Fast for honest and truthful purposes." There's a hidden sweetness in the stomach's emptiness. We are lutes. No more, no less. If the soundbox is stuffed full, there is no room for music. up the steps before you. Emptier—write secrets with the reed pen. an ugly metal statue sits where your spirit should. friends who wish to help. Don't give it to some illusion and lose your power. Ketosis Explains the muscle-sparing process of the body during different types of fasts. Cleansing Diets offers guidance on using a cleansing diet as a partial fast or as a means of preparation for other types of fasting. The real benefits of Fasting for Weight Loss, affecting deep and lasting changes in our lives. Emotional Benefits of Fasting offers insight on the healing effects fasting has on our emotional and mental patterns.